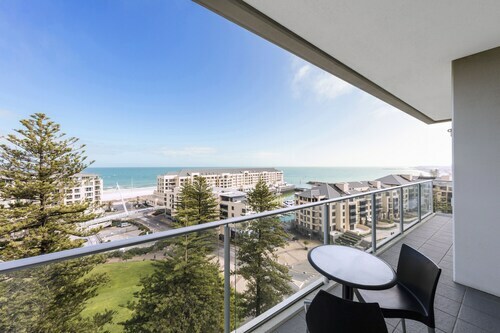 Situated near the beach, this luxury apartment building is within a 10-minute walk of The Beachhouse and Glenelg Beach. West Beach and Brighton Beach are also within 3 mi (5 km). 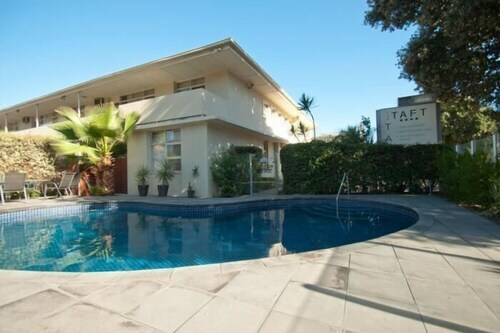 Situated near the airport, this motel is within a 10-minute walk of Holdfast Marina and Glenelg Beach. West Beach and Brighton Beach are also within 3 mi (5 km). 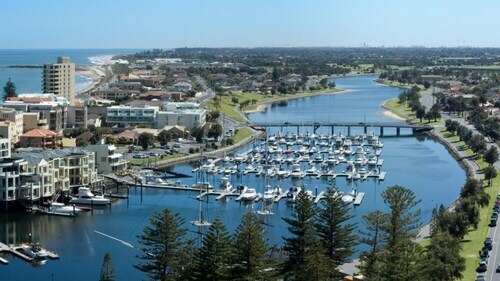 Situated in Glenelg, this motel is within a 10-minute walk of Holdfast Marina and Glenelg Beach. West Beach and Brighton Beach are also within 3 mi (5 km). 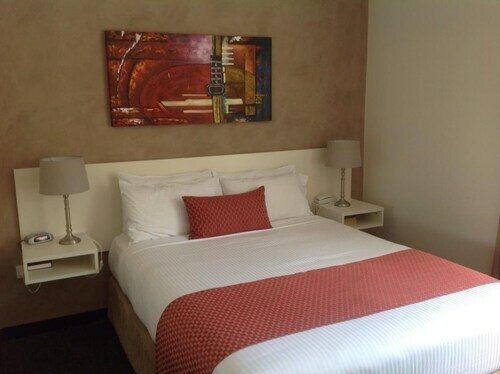 Situated near the beach, this motel is within a 10-minute walk of Jetty Road and Glenelg Beach. West Beach and Brighton Beach are also within 3 mi (5 km). Escape to Adelaide's beachside suburb, Glenelg, South Australia's very first settlement town. While you stay in one of our Glenelg hotels, you'll be able to chill out on the beach, immerse yourself in the region's rich heritage and even go swimming with dolphins. To learn a little about the town's interesting history, head to the Bay Discovery Centre inside the Town Hall. The centre acts as a mini museum but also houses an art gallery on the mezzanine floor, displaying work from up and coming local artists. Afterwards, you can visit the harbour and check out the replica of the HMS Buffalo, the first ship to transport settlers to South Australia back in 1836. You can climb aboard the ship and wander around the museum before tucking into some delicious seafood at the highly acclaimed Buffalo Restaurant. Another fantastic place for dining is along Jetty Road, where you'll find plenty of alfresco restaurants and trendy cafes, with just about every international cuisine imaginable. If you're just keen to bum around on the beach, you'll enjoy the white sandy shores and glistening waters of Glenelg's gorgeous coastline. Scattered along the waterfront you'll also find 15 unusual sculptures and pieces of artwork, so take a few photos in front of them. If you're interested, you can learn more about the artworks, and the inspiration behind them, at the Bay Discovery Centre. For a laugh, head to the Beachouse and enjoy the side show rides, arcade games, Ferris wheel, water slides and mini golf course. Or, if you're here on December 27 and 28, head down to the beach and join in the festivities of the Bay Sheffield Carnival. This festival has been running since 1886 and the highlights of the event are the famous foot races, so don't miss out. 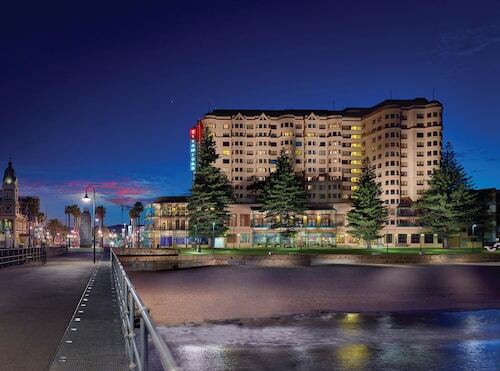 Glenelg is only 8km from the airport and 10km from the Adelaide CBD. While you're here, you can easily get around on public trains and buses but for a bit of fun, you can take the 25 minute tram ride to the city centre on the vintage electric tram, built in 1929. Or, if you'd like to sample a drop of some of Australia's finest wine, wot about visiting the Barossa Valley, which is only an hour away? Book your cheap flights to Adelaide and your Glenelg accommodation with us now and get ready to enjoy a relaxing beachside holiday in this quaint Adelaide suburb. How Much is a Hotel Room in Glenelg? Hotels in Glenelg start at AU$101 per night. Prices and availability subject to change. Additional terms may apply. Very nice overall, rooms a little tired. Our window was broken and although I reported it to staff 3 times over our stay it was not repaired. Otherwise good.